This article first appeared on GR on July 14, 2016. This week another toxic revelation dripped out of the Chilcot Report. According to top British SAS officers, US commander Stanley McChrystal’s counter-insurgency “black-ops” featured a program of relentless violence designed to ‘speed up’ the process of political cleansing and the so-called “reconstruction” of Iraq. 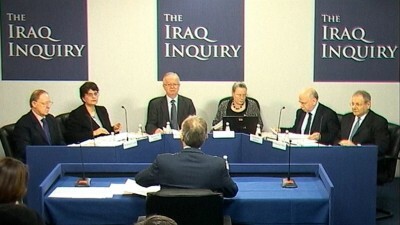 What also interesting here, is the Chilcot’s choice of language, including the term “Latin American-style death squads”, which by default implies the United States government was party to war crimes in Central America during the 1980’s – a claim which it has always been strenuously denied in public, even though the general public and academia recognizes this to be a self-evident fact of America’s long-running ugly history of intervention in that region. The Independent also detailed how reckless and violent practices by the US military caused noticeable divisions and splits between joint US-UK command structures and operations, including political tension between British military command. Through the newly created ‘Office of Special Plans’, neoconservatives Paul Wolfowitz and Douglas Feith rolled out their own sub-layer to the US controlled shadow government in Iraq, including the establishment of the “Iraqi De–Baathification Council” which, under the supervision of then US Viceroy Paul Bremer, began dismantling the Iraqi military, security and intelligence agency infrastructures of President Saddam Hussein. And so began the process of the Pentagon’s ‘de-Baathification’ process in Iraq, immediately followed by a hive of violent ‘Gangs and Counter-gangs’ created by the US and UK covert military and intelligence apparatuses. Front and center in this effort were US operatives John Negroponte and his understudy at the time, Robert Ford, who was later dispatched as US Ambassador to Syria in the run-up to the Syrian Conflict which began in 2011. The legacy of this destructive policy still lingering in Iraq and now in Syria. This unquestionably spawned ISIS and many other terrorist factions in both Iraq and Syria. Only last week, Iraq saw its most deadly car bomb ever, a questionable ‘sectarian attack’ (a narrative not challenged by the western and international press) which killed 200 innocent civilians, and injured many more. Once again, we can see the revelation of the US-UK method of not simply instigating wars, but facilitating dirty wars not only overseas, but also at home, as in the case of Operation GLADIO and numerous other false flag events admittedly staged in North America. Details have emerged of how US and UK Special Forces clashed and drifted apart over the conduct of the Iraq occupation, with one British officer complaining about the use of tactics more akin to “Latin American-style” death squads than a modern military. The details of the Balad special forces base and its operations, which came to shape the war, are not recounted in last week’s long-awaited report by Sir John Chilcot. However, kill or capture operations in and around Baghdad, launched from the Balad base 50 miles (80km) north of the city, were a key if little known chapter in Britain’s shadow war, the Independent reports. The mission, under now-famed US General Stanley McChrystal, involved a shift from searching for apparently non-existent weapons of mass destruction (WMD) to man-hunting. Antagonism over the tactics led to UK troops being banned from some operations and a UK SAS commander lodging a complaint with US authorities for talking about British involvement in operations. Another SAS colonel was also ostracized from his regiment after serving under McCrystal. Chilcot does sketch out some of the details of the growing rift, though his report appears to leave out direct references to Special Forces operations. “US and UK strategies had, in effect, been on different courses since the UK decision to focus its attention on MND (SE) [Multi-National Division South East, the British run zone] in 2003. As result of this decision, the UK had acquired distinctly different priorities from the US,” the 2.6-million-word report argues. From that point on, it appears, the US became increasingly concerned that a wavering UK was chiefly focused on getting out of the unpopular war in the best order it could and as soon as possible. “The Americans were doing things like chucking farmers into Abu Ghraib [the notorious prison in Baghdad where US troops abused and tortured Iraqi detainees] or handing them over to the Iraqi authorities, knowing full well they were going to be tortured,” he said at the time. It may be of note that the SAS commander’s reference to “Latin American-style deaths squads” appears to ignore the fact that at time of the Iraq war, in July 2003, the UK was itself stepping up training of Colombian paramilitary forces.